I “discovered” existential psychology back in 2008 while a PhD student at Saybrook University. At the time, I was undergoing a crisis of meaning, or perhaps it’s more appropriate to say a “crisis of control.” I had slipped into a deep depression due to the fact that life was just not doing what I wanted it to do. Like many people seeking meaning within in human potential circles, I had come to believe the New Age party line that “Nothing is Impossible! Everything is Possible!” All I needed to do was adjust my attitude, perfect my Warrior One yoga pose, drink a quart of carrot juice a day, and the world would open up without limit, in a way that all my desires would offer themselves up to me once and for all. But they didn’t, and for me, the first half of 2008 was spent in a state of grief, shame, and uncomprehending anxiety as I tried to understand why, after all that psycho-spiritual work and carrot juice, I had not manifested the reality that existed within my head. What comforted me most about this existential attitude was what felt to me to be the utterly sane perspective that it was due to falling too far to one side of the equation or the other—either believing that you have no control over your existence or believing yourself to have absolute control over your existence—that leads to our deepest anxiety and despair and sense of alienation within the world. What existential psychotherapy prescribes, it seemed to me, is a means of learning how to exercise our vast freedom of choice and will within an existence that, nevertheless, has certain limitations and inevitable conclusions over which we have little to no control. This was a philosophy and a way of living that I could hang my hat on. Around this same time, I was halfway through my doctoral fieldwork, researching the concept of yanantin or “complementary opposites” and its role within the psychological lives of indigenous Andeans living in or near the city of Cusco, Peru. As a philosophical ideal, yanantin reflects the Andean perspective that the polarities of existence (male/female, knower/known, inner/outer, and so on) exist in a complementary and interdependent relationship, and that the tensions that occur between these often seemingly antagonistic categories can be mediated through ritual, turning the tensions and anxieties occurring within this “battle” into an elegant “dance” (Webb, 2012). Having just been opened up to the concepts of existential psychology, I found myself noting certain similar perspectives within indigenous Andean thought and practice; becoming aware of some of the culturally specific tools and techniques that my research participants had for navigating the anxiety-provoking paradoxes of existence. 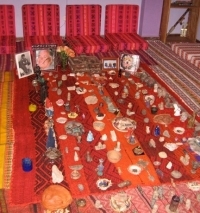 One of these tools is the mesa, the Andean healer’s ritual altar. Viewed through an existential perspective, the mesa can be seen as a tangible-symbolic means of working with the tensions created by the paradox of freedom versus limitation. According to my research participants, one of the purposes of their healing rituals is to create opportunities in which shifts in consciousness can be made that allow the individual (or community) to establish a state of psycho-spiritual equilibrium, in which the opposing forces of existence that so often send us into a state of anxiety and dis-ease can be brought into a dynamic and mutually informing relationship. For those of my research participants who act as healers within their communities, the mesa is the primary means through which this rebalancing is enacted. Many healers divide their mesas into three major “fields.” The far left side of the mesa is called the “Field of the Magician” or the “Field of Personal Will,” and it is here that the healer exerts his or her personal desires for transformation (e.g., healing, protection). The far right side of the mesa is called the “Field of the Divine” and is where things are brought into alignment according to the Will of Spirit. Working within this field, the healer abandons personal agenda and allows cosmic flow to take control. This is a delicate process, for while too much emphasis on the Field of Personal Will can lead one to exert power over other people (“sorcery”), a healer who abandons personal agenda and focuses too much the Field of Divine Will may have trouble bringing his or her intent to fruition (Webb, 2012). In order to return the physical or psychological system to a state of balance, the healer’s task is to harness both sides of the mesa—personal will and cosmic will—bringing the opposing energies into relationship within the center field, called Campo Medio or “Field of the Middle.” This middle ground is the place between Will and Surrender. In the center field, a dynamic and balanced interaction between Personal Will and Divine Will unfolds, re-establishing a healthy state of being through a release of tension. Through the enactment of the mesa healing rituals, “transformation in the sufferer’s self-understanding is accomplished” in order to “redirect the patient’s attention to various aspects of his life in such a way as to create new meaning for that life” (Joralemon & Sharon, 1993, p. 248). From an existential perspective, the mesa ritual provides a means of negotiating the competing forces of limitation and freedom (in the form of Divine Will and Personal Will), offering the individual an ontological map for mediating the tensions that come from the struggle of an existence of being both actor and acted upon. Within both existential psychotherapy and the indigenous Andean perspective, alienation—the feeling of being at odds with both ourselves and the world around us—signifies a radical rupture in the relationship between the forces of Will and Surrender, one that often leads to despair. In order to return to a state of psychological wellness, one must find a workable balance between these two often-competing aspects of existence. As a psychological anthropologist, I find it exciting to consider the ways in which non-Western cultures address the various existential concerns, offering us greater opportunities for reconsidering and reworking our relationship to Being. Joralemon, D., & Sharon, D. (1993). Sorcery and shamanism: Curanderos and clients in northern Peru. Salt Lake City: University of Utah Press. Spinelli, E. (1997). Tales of un-knowing: Eight stories of existential therapy. New York: New York University Press. Webb, H.S. (2012). Yanantin and masintin in the Andean world: Complementary dualism in modern Peru. Albuquerque: University of New Mexico Press. Note: The indigenous Andeans with whom I worked during my fieldwork never used the term “existential anxiety,” nor did they ever show a desire to assess their beliefs and practices within this philosophical structure. The correspondences and connections made in this essay between Andean healing practices and the Western existential perspective are purely my own, reflecting my own professional interest in considering how a given culture’s ontological relationship to consciousness influences and informs the individual’s psychological experience of Being. Today’s guest contributor, Hillary S. Webb, PhD, is a psychological anthropologist and the author of Yanantin and Masintin in the Andean World: Complementary Dualism in Modern Peru, Traveling between the Worlds: Conversations with Contemporary Shamans, and Exploring Shamanism.